Although I never counted how many pictures I take every year, as a Toronto wedding photographer I shoot a lot. Also, I have my favourites and this is one of them. I create this beautiful image during a Crystal Fountain wedding. Crystal Fountain is a beautiful banquet hall but more about that some other time. Let's focus on this gorgeous image first. When a Romanian girl marries a handsome Greek guy, their wedding has to be spectacular and fun!!! After all, those nationalities know how to party! The bride and groom chose Crystal Fountain Banquet Hall as the venue for their wedding! It was a great choice in my opinion because this wedding venue offers beautiful backdrops conducive to great photos. The main hall features marvellous crystal chandeliers that create a gorgeous bokeh when out to focus. The photo you are viewing has received a Professional Wedding Photographers Award in the reception section in Winter 2016 competition. How did I take this photo? During the father daughter dance, the flower girl started dancing as well so I placed myself in a favourable position, set my four lights to properly illuminate the scene and captured this beautiful moment. 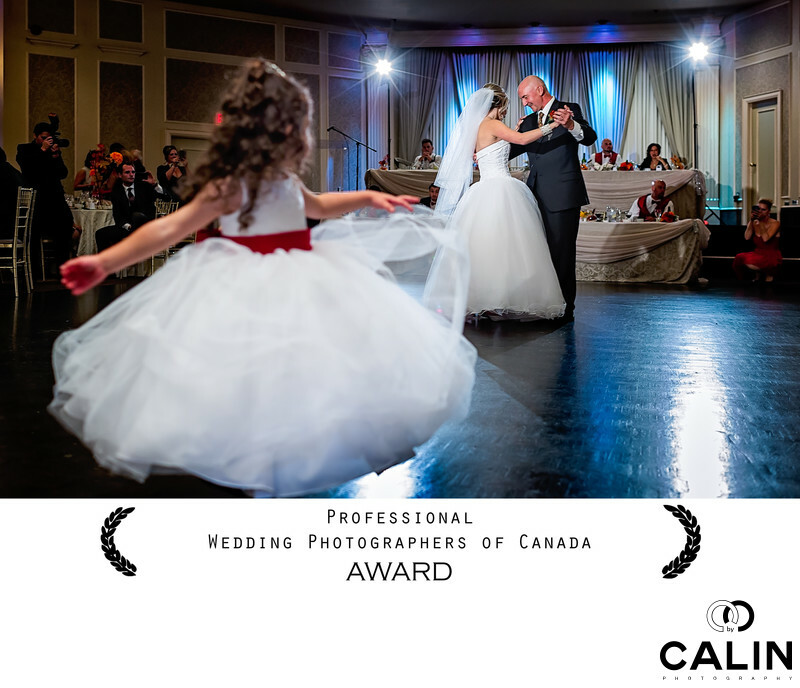 I took this image using a Canon 24 – 70 F2 .8 L lens and that shot at 24 mm so I can capture both the bride and her father doing the father – daughter dance and the beautiful venue. When I started shooting, I noticed the flower girl approaching the dance floor. She started twirling and I sensed there was a great photograph around the corner. After taking a few frames I knew I had the winner. In terms of lighting this is a rather complex scenario. I used to flashes as separation lights behind my subjects. The were gelled with CTO filters to match the ambient light in the venue. I also used a video light to project a beam onto the couple. Finally, I bounced my on the camera flash to create some fill light. Yes, I know, it sounds like overkill but this is a world-class image. Besides the complex lighting scheme, the composition is flawless. The bride and her father are positioned according to the rule of thirds and so is the flower girl. Her hands creates a leading line towards my main subjects (father & daughter). Besides, all the guests are looking at the couple dancing, forming multiple leading lines which, according to the continuance Gestalt principle make this a striking wedding photograph. Even more, this image includes several layers, each of them with its own story. In the foreground the flower girl is dancing. In the middle ground, the main subjects are engaged in their father daughter dance. Finally, in the background the guests are looking at the couple and taking pictures. To create such an exquisite image, I have to admit, I was lucky. Without the help of the flower girl, this would not be such a strong photograph. This shot is almost perfect with one exception. My second shooter is still visible in the left side of the frame. Through dodging and burning his not noticeable, but I know his there. Location: 60 McDowell Gate, Markham, ON L6G 1B5.